Established in 2002, the Law Offices of Sayson & Associates have constructed a hard-earned and well-deserved reputation of excellence in providing sophisticated, no-nonsense and cost-effective business and legal solutions for its clients. One of the premier small, boutique law firms in Los Angeles County, the Law Offices of Sayson & Associates offers clients world-class quality entertainment law legal work and exceptional, personalized client service. From its offices in Santa Monica, CA, the attorneys of the Law Offices of Sayson & Associates serve the world's leading media and entertainment companies across the United States and abroad on an international scale. With clients ranging from multinational corporations to small companies and individual entrepreneurs, every relationship is valued greatly. Each client engagement benefits from the specialized knowledge, experience and expertise from attorneys and staff professionals dedicated and committed to exceeding client expectations. The Law Offices of Sayson & Associates are proud to offer its counsel to you and pledge to work hard every day to earn your trust and loyalty. Joey Arnel Sayson is the founder and principal of the Law Offices of Sayson & Associates. With over 20 years of experience in the entertainment industry, first as an administrative assistant in the Business and Legal Affairs Department of MGM and later as an attorney at several Hollywood studios, Joey has been involved in entertainment law transactions since arriving in Los Angeles in 1989 from Lebanon, Pennsylvania. 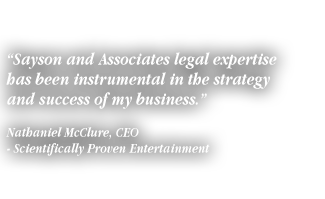 He has been practicing entertainment law as in-house counsel or in private practice since 1995 while working for and with major studios, independent production companies, small businesses and individual artists in film, television, radio, interactive games, evolving new media, website development and music. Prior to forming his own law firm in 2002, Joey worked as an in-house business & legal affairs attorney for over 7 years at Metro-Goldwyn-Mayer, Universal Studios Consumer Products Group and Universal Interactive. His experience includes negotiating and drafting agreements regarding the acquisition, development, production, financing and distribution of motion pictures, television programming, radio programming, interactive games and evolving new media content. Presently, Joey negotiates and drafts agreements for major studios, producers, writers, directors and talent, handling rights acquisitions, licensing deals and production agreements across the wide spectrum of traditional and evolving new media. Additionally, Joey routinely advises clients regarding intellectual property rights issues. Joey is a graduate of the University of Pennsylvania and received his Juris Doctor degree from Whittier Law School in Costa Mesa, CA. He is a member of the State Bar of California, Beverly Hills Bar Association, Los Angeles County Bar Association, Ventura County Bar Association and International Licensing Industry Merchandisers' Association. During football season he can heard on the sidelines coaching for the Santa Monica Vikings Youth Football teams on Saturdays or cheering for the Dallas Cowboys on Sundays. Year round he is passionate about his wife, his family and making music with his guitars (generally, in that order). Joey's favorite musical artists, in no particular order, are Stevie Ray Vaughan, Joe Pass, The Allman Brothers Band, The Beatles, The Rolling Stones, U2, Sting, Derek Trucks, The Tedeschi Trucks Band, Stevie Wonder and Prince. He listens to rock, blues, R&B and jazz and plays all those styles of music on his Ribbecke Halfling archtop guitar, Taylor 414 acoustic guitar, Fender John Mayer Stratocaster guitar and vintage Epiphone Genesis electric guitar. He also thinks it's weird to write about himself in the third person and would rather have a personal conversation with you. Please contact me! The Law Offices of Sayson & Associates is a minority-owned small business firmly committed to developing and maintaining a diverse workforce that is a reflection of the local and worldwide communities we serve. 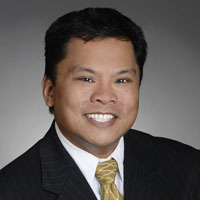 To meet that goal, the firm's founder, Joey Arnel Sayson, personally directs the firm's efforts to create and sustain a workplace environment where all administrative support staff, law clerks and attorneys have opportunities to develop their careers and feel welcomed, valued and energized about the contributions they make while serving our clients. The firm's commitment to diversity was never more evident than the day it extended its first attorney employment offer to a minority woman -- and that commitment continues as on-campus law school recruiting efforts for its law clerk externship program have been expanded to include law schools that have more ethnically diverse student enrollment. A diverse staff with wide-ranging backgrounds, experiences and perspectives enable the Law Offices of Sayson & Associates to serve a broad spectrum of clients. The Law Offices of Sayson & Associates has acknowledged and recognized the importance of ecology and its shared responsibility of stewardship toward the planet. To that end, the firm has demonstrated its commitment to the environment long before "going green" became fashionable by establishing a comprehensive and growing array of policies and procedures to minimize the firms carbon footprint.